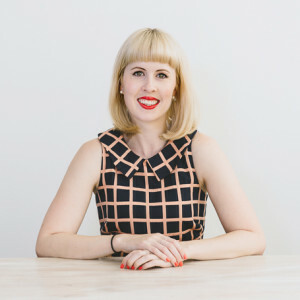 Something pretty incredible is happening to Newcastle right now. 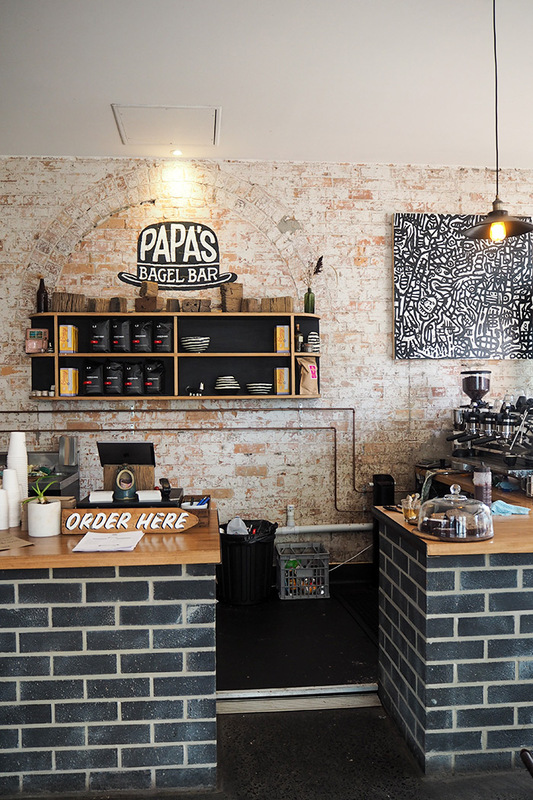 Vacant shops are being filled with boutique coffee houses and organic cafes, small bars are opening up and laneways are being decorated with colourful street art. I must admit Newcastle hadn’t really been on my radar as a weekend away destination, but since I’ve come back I can’t stop raving about it! The food! The cocktails! The shopping! 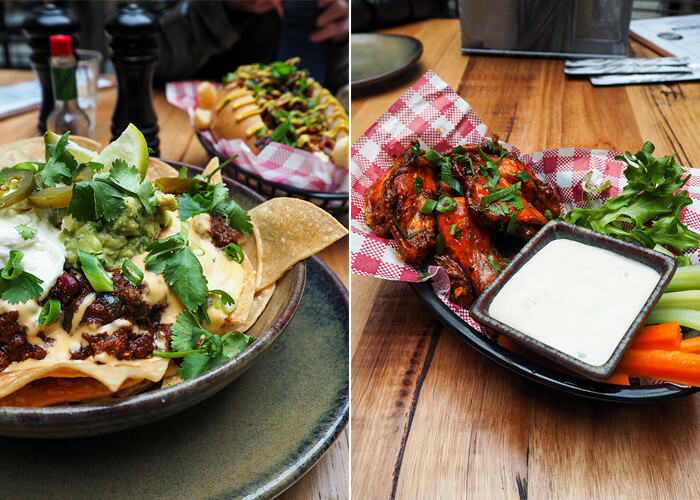 This is part 1 of my guide to Newcastle, focusing on the amazing array of food and drinks available in Newcastle right now. Stay tuned for part 2 which covers sightseeing and shopping. 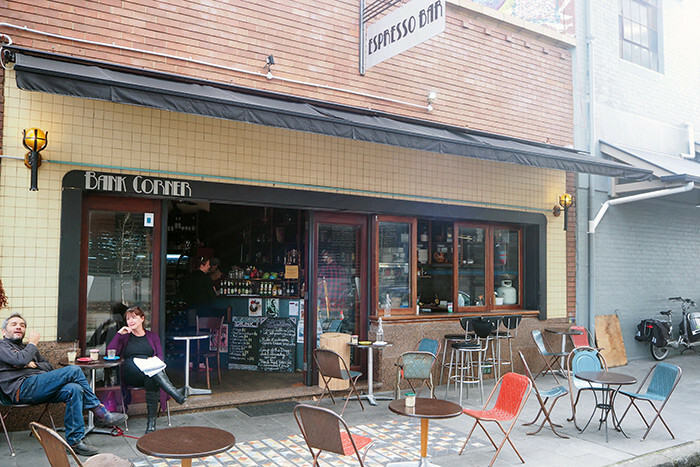 Estabar – 61 Shortland Esplanade, Newcastle NSW 2300. 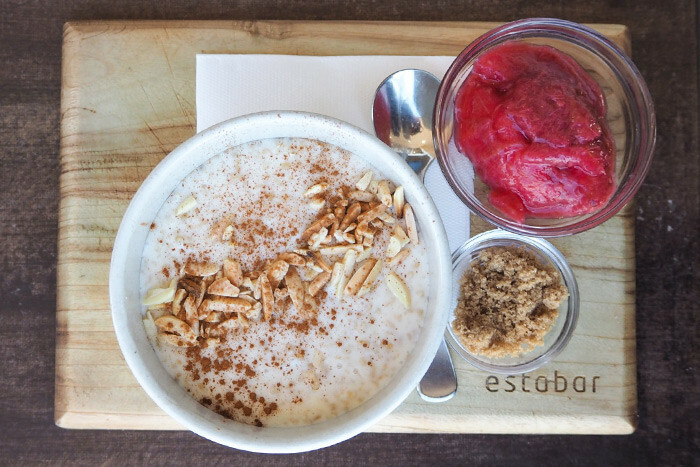 Situated by the beach, Estabar’s all day breakfast menu featuring locally sourced ingredients is the perfect way to kick start your day. 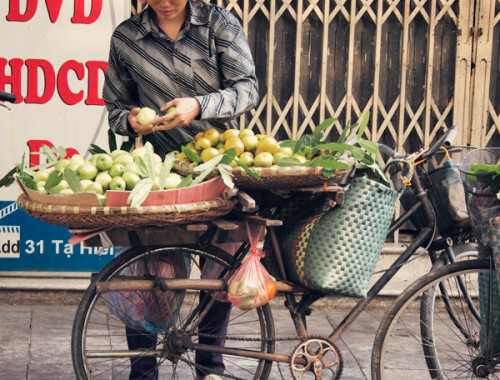 I was impressed with the sheer volume of food that they can pump out from their tiny kitchen! 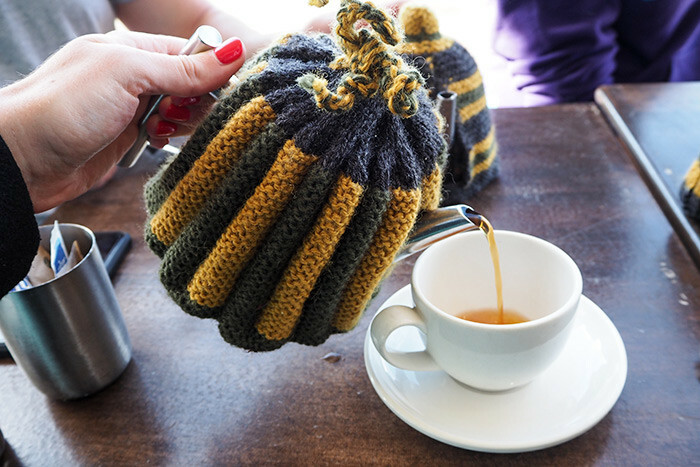 And all the tea pots arrived with the most gorgeous tea cosies! 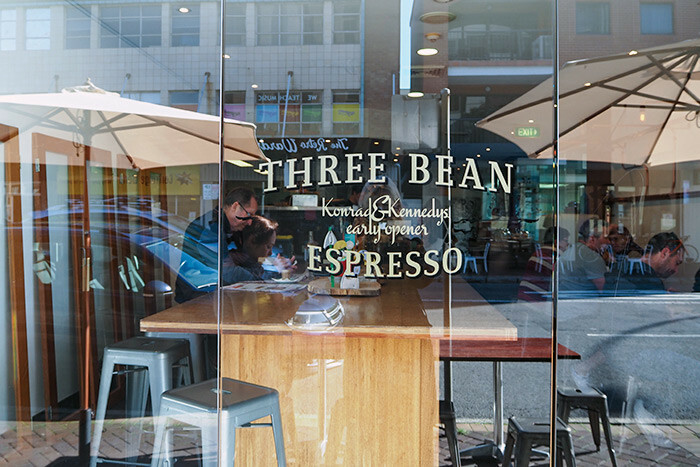 Three Bean Espresso – 103 Tudor Street, Hamilton NSW 2303. 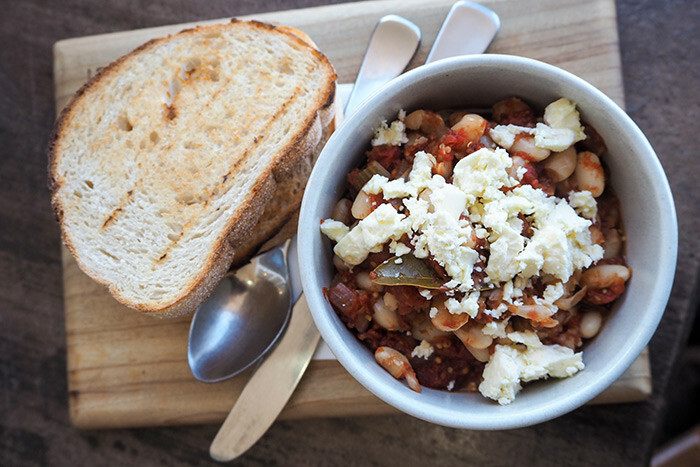 Three Bean Espresso is an innovative cafe that wastes nothing – the yoghurt is made from the leftover milk from the coffee and they use the discarded coffee grounds to grow their own mushrooms! 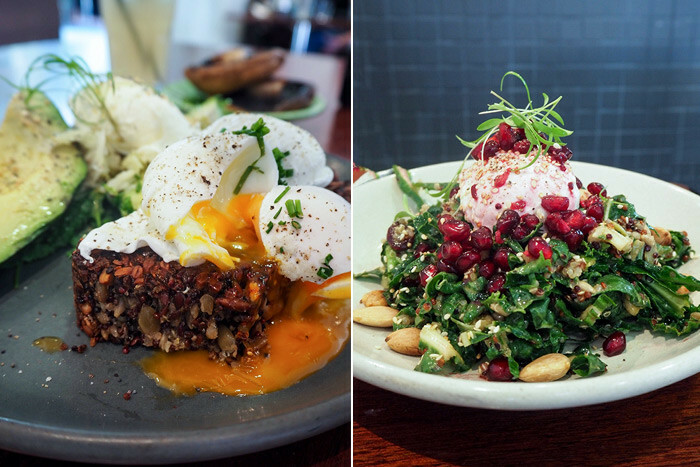 With a huge range of cultured foods and products available such as kombucha, kefir and sauerkraut, this cafe wouldn’t be out of place in Bondi! 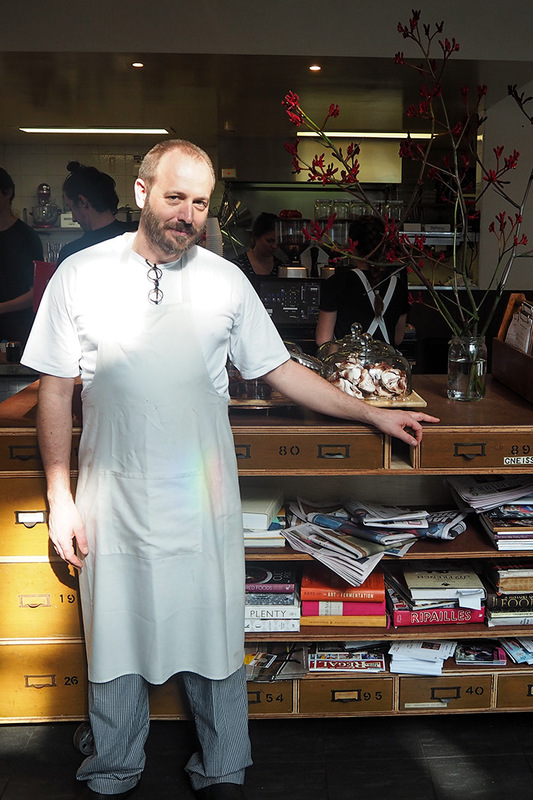 Head chef and owner Ben, whose passion for wholefoods and sustainable cooking has made Three Beans a real standout in the Newcastle scene. 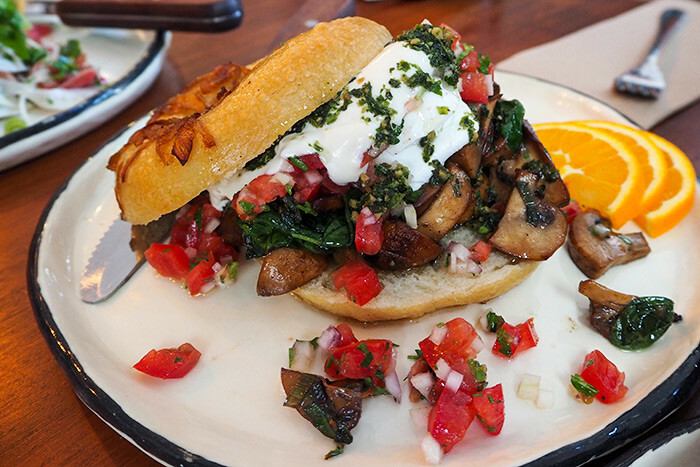 Poached Eggs on Life Changing Bread with Avocado and Feta and the Wonderslaw of kale, pomegranate and almonds, topped with homemade yoghurt. 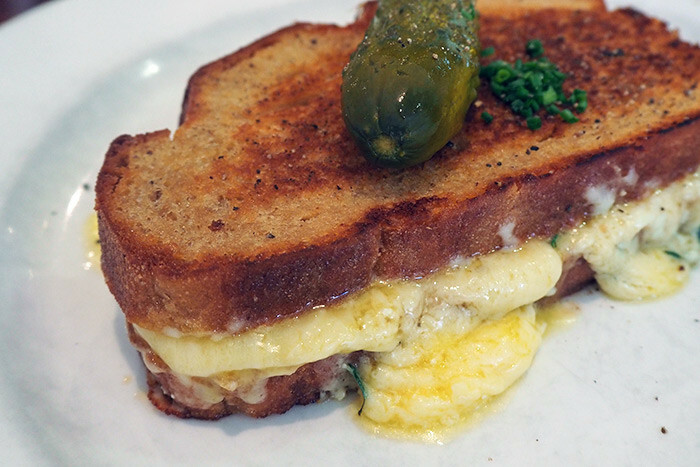 And to balance out all that healthy eating, I couldn’t go past ordering this amazing toastie – it’s a vintage cheddar toasted sandwich with béchamel & thyme. Heavenly. The decline of bookshops has made me sad, I use to love nothing more than sitting in the corner of one for the afternoon with a cup of tea and book. 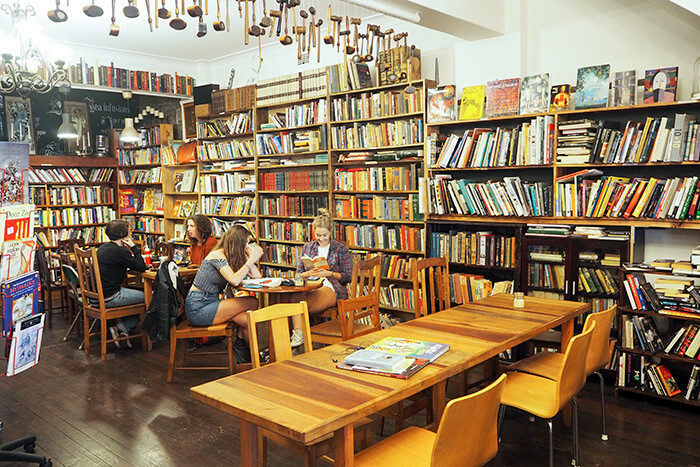 Fortunately, The Press Book House is filled to the brim with books, along with tables and chairs to enjoy their divine array of food and drinks. We started with 2 delicious vegan dishes house made hummus and spiced carrot salad and an olive tapenade and pickled fennel and cucumber salad. 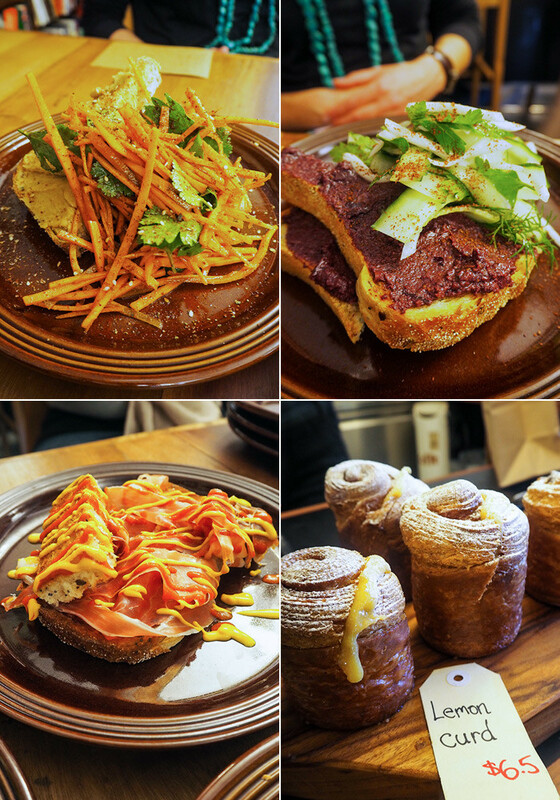 This was followed by their delicious take on Egg in a Hole – a toasted piece of sourdough filled with a fried eggs and topped with prosciutto and lots of ketchup and mustard (so delicious) and a lemon curd cruffin! 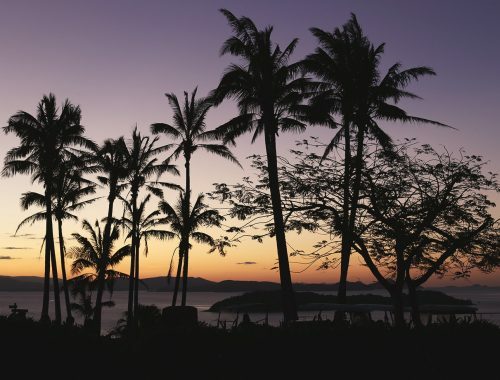 This place is kind of my idea of heaven. It has a grungy, industrial fit out, awesome branding, locally made dinnerware (I waned to steal the plates!) and the smell of freshly baked bagels. 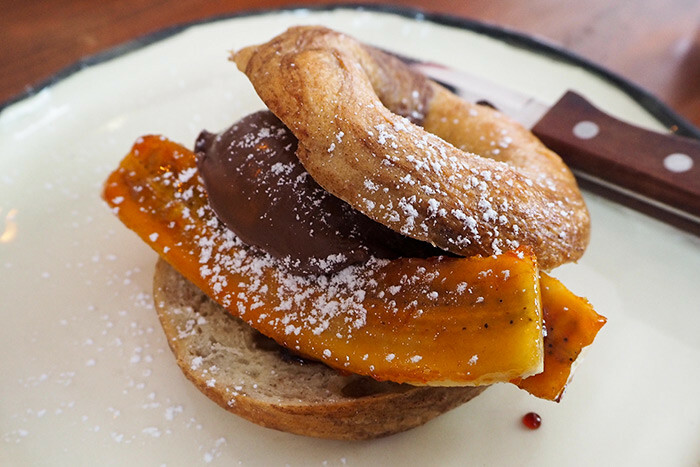 Nutella and caramelised banana on a freshly baked bagel. This was life changing, please order this. 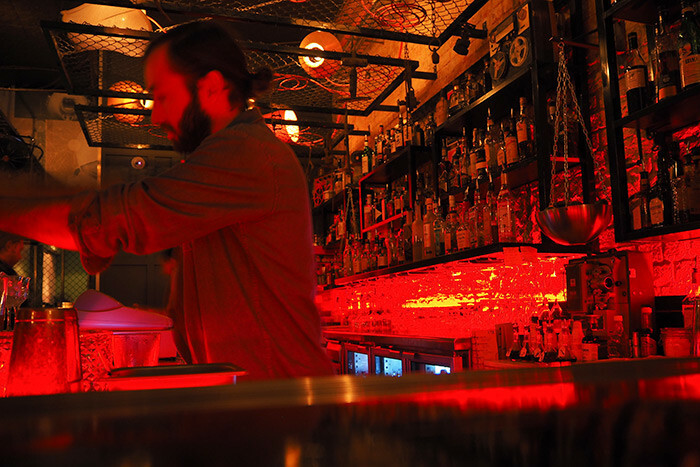 The Lucky Hotel – 237 Hunter Street, Newcastle NSW 2300. 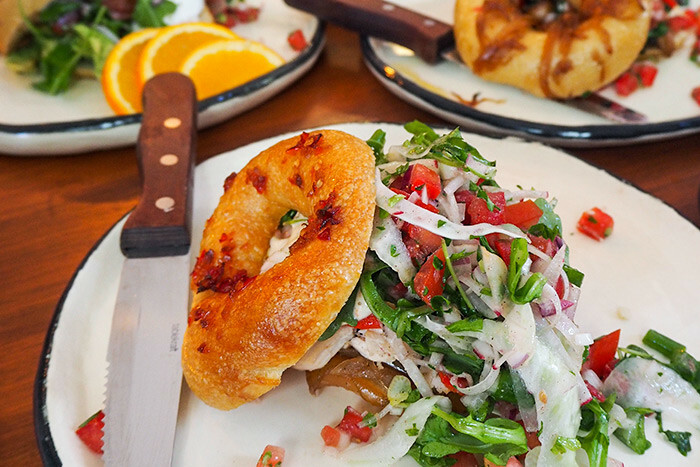 The Lucky Hotel menu focuses on authentic Southern American BBQ, where the meat is smoked low and slow over hickory wood. 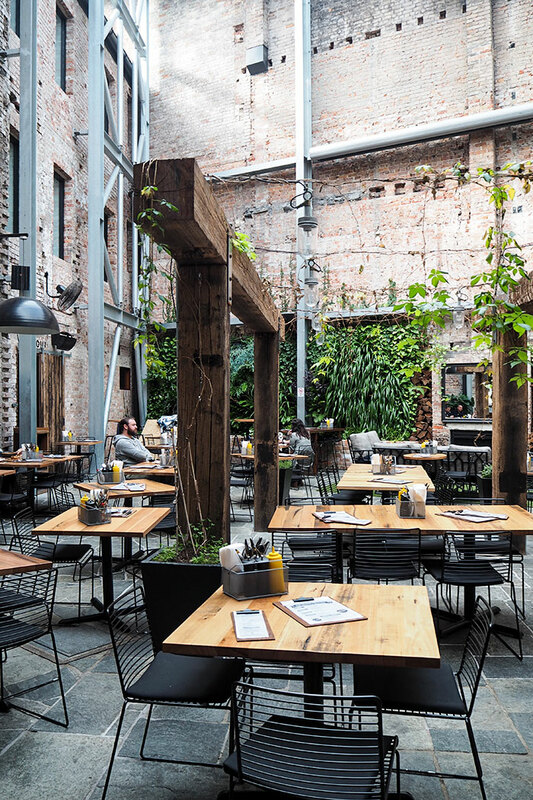 It has been recently refurbished, complete with a beer garden that combines its original industrial fixtures and lush greenery snaking about the place. We got a little excited and ordered a LOT of food. Highlights include the Chilli Con Carne Nachos with Corn Chips, Guacamole, American Cheese, Sour Cream & Jalapeños and The Lucky Dawg – Pork Sausage, Chilli Beef, Crunchy Fried Onion, Bacon, Sweet Mustard, American Cheese on a Brioche Roll. My other favourite was the Hot Buffalo Chicken Wings served with Carrot & Celery Sticks and Blue Cheese Dipping Sauce. 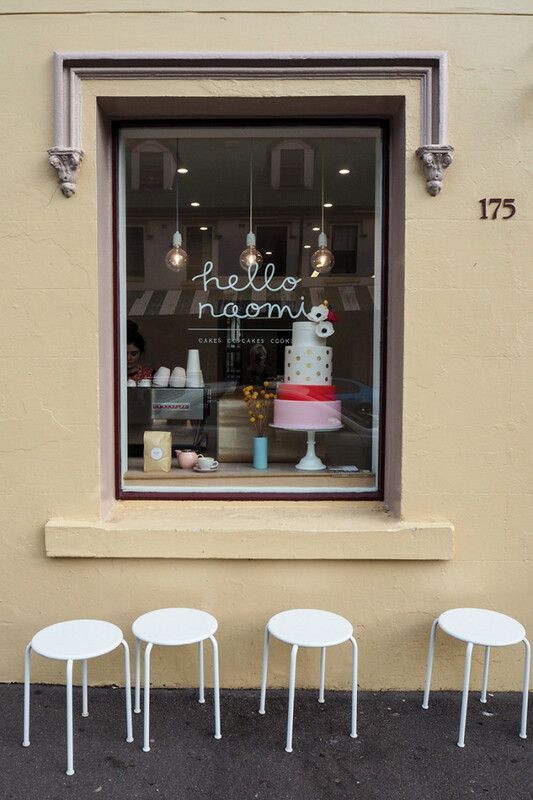 Momo Wholefood Cafe – 227 Hunter St, Newcastle NSW 2300. And to balance out all that rich food, we stop off at Momo Wholefood Cafe for a wholesome lunch. Serving up a huge range fresh food made from local + organic ingredients, this is the kind of place I could eat at everyday. 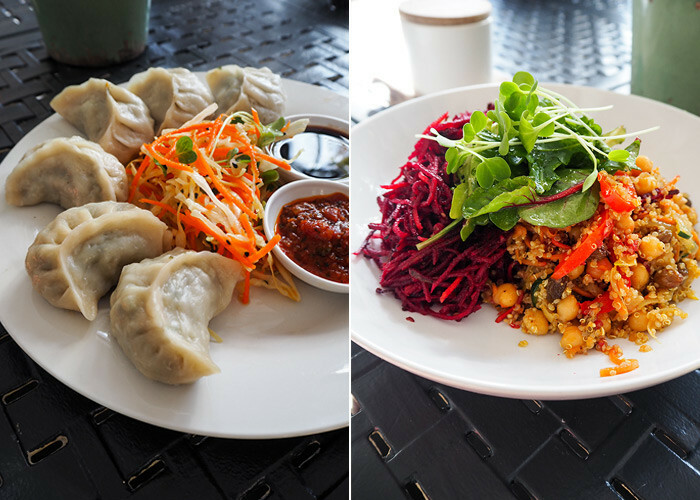 We ordered the Handmade Tibetan Steamed Dumplings and the salads of the day. 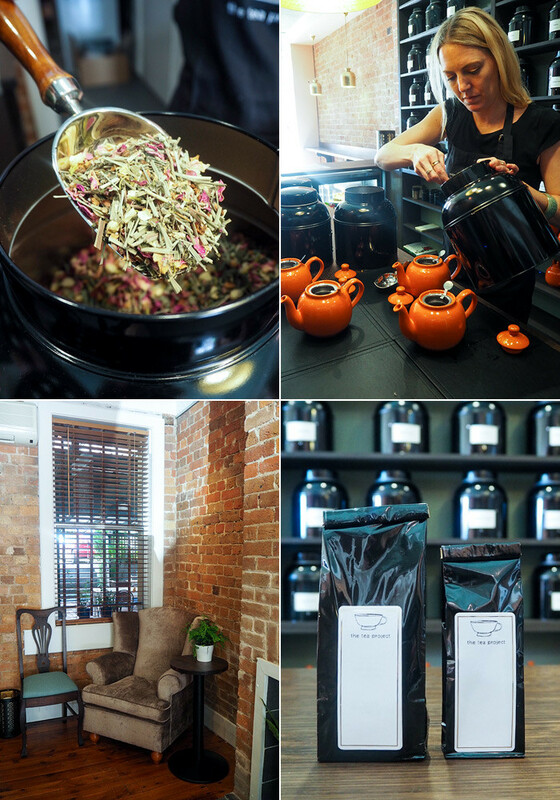 The Tea Project – 177 King Street, Newcastle, New South Wales 2300. I was in tea heaven when I visited The Tea Project. This place stocks over 70 types of unique tea flavours sourced by the owner Becci. Her passion and enthusiasm for tea is endless and I ended up buying 3 types as I couldn’t make up my mind! 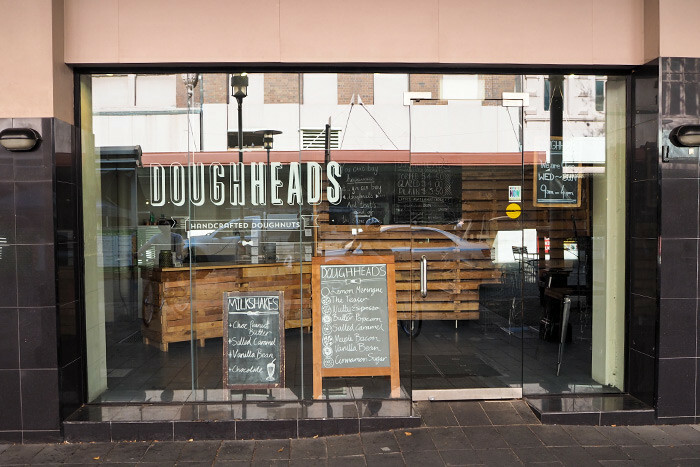 Sadly we were unable to visit Doughheads as they are only open Wed-Sun, but I’ve heard enough rave reviews to still feel confident in recommending them (and to include a sad picture of their closed store). Doughheads, I’ll be back! When I heard I was going to Newcastle my first question was “can I visit Hello Naomi? 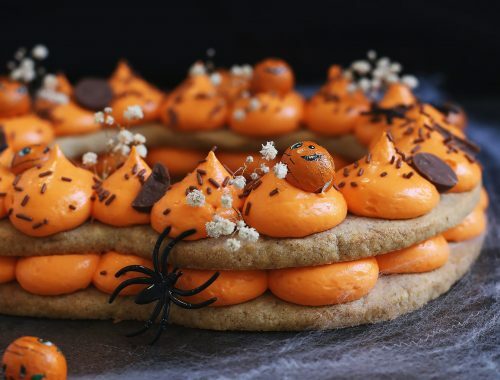 !” I’ve been following them on Instagram for as long as they’ve been open and couldn’t wait to try her famous treats! 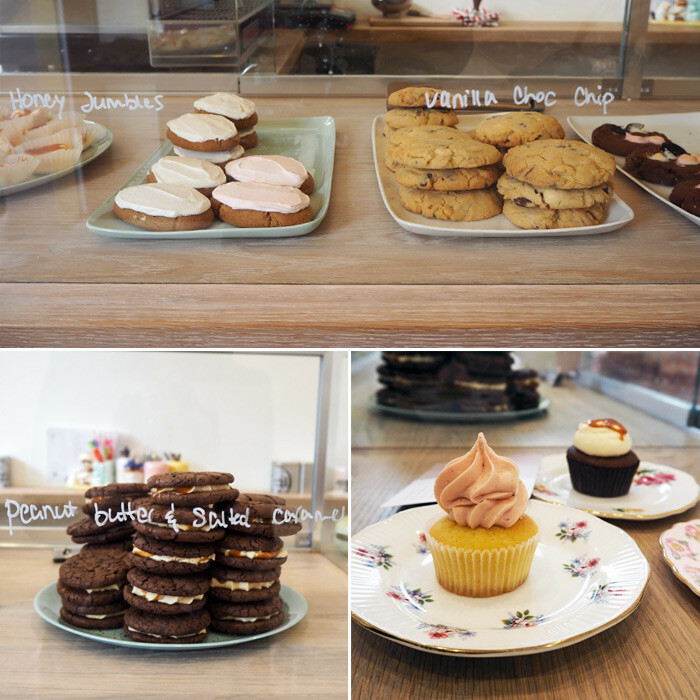 The store was adorable and I tried 6 different desserts (for research purposes, of course). 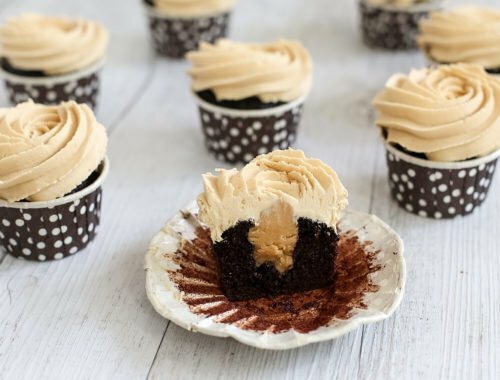 Highlights included the choc chip cookies, vanilla cupcakes and honey jumbles, but I have to say my favourite thing was the peanut butter and salted caramel brownie sandwich. I wish I had one now. We also ducked into the Bank Corner for a coffee. 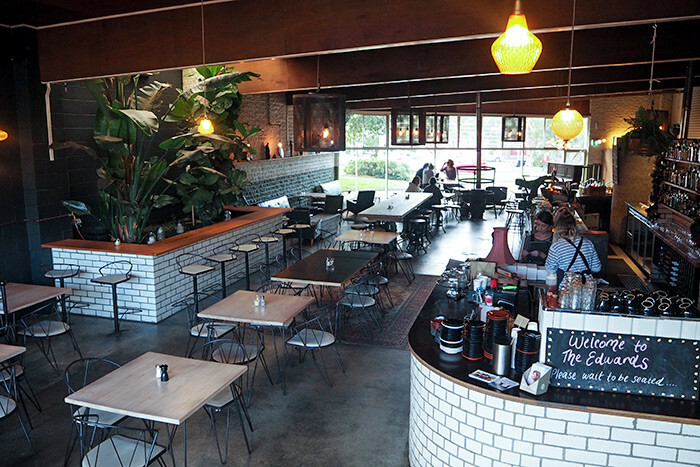 I loved it’s retro fit-out, delicious coffee and super friendly service. I can’t wait to return and try the Italian-inspired menu! 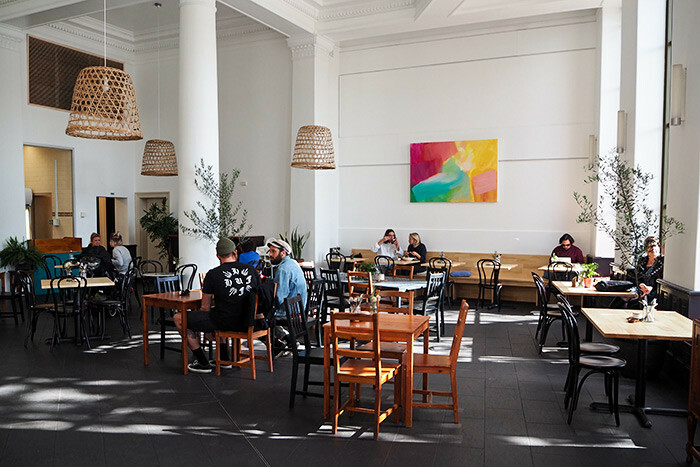 Restaurant Mason is one of just 2 restaurants in Newcastle to be awarded a prestigious One Chef’s Hat from the Sydney Morning Herald Good Food Guide Award. 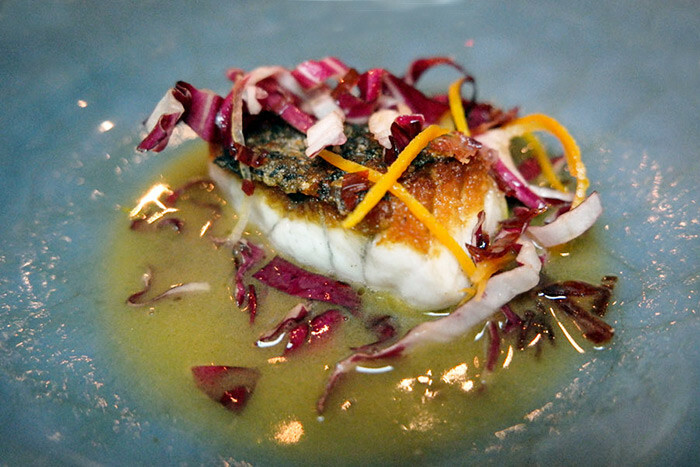 And it should come as no surprise as head chef Chris hails from Michelin starred The Ledbury in London. 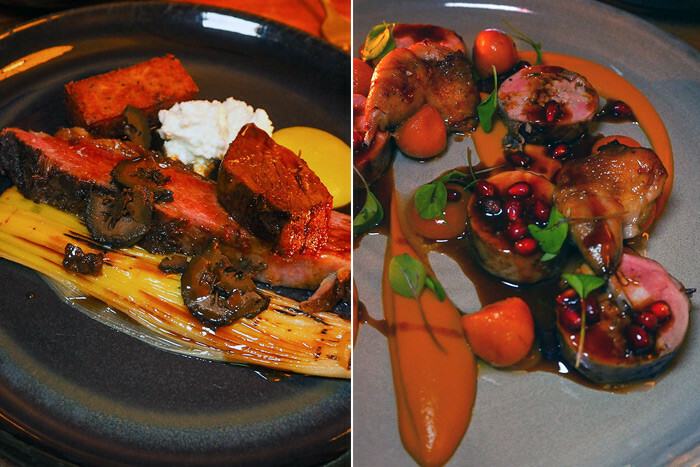 Our mains included 36 Hour Beef Short Rib, Grilled over Charcoal, Charred Shallots and Potato, and a Ballotine of Redgate Farm Quail, Mandarin, Pumpkin and Pomegranate. 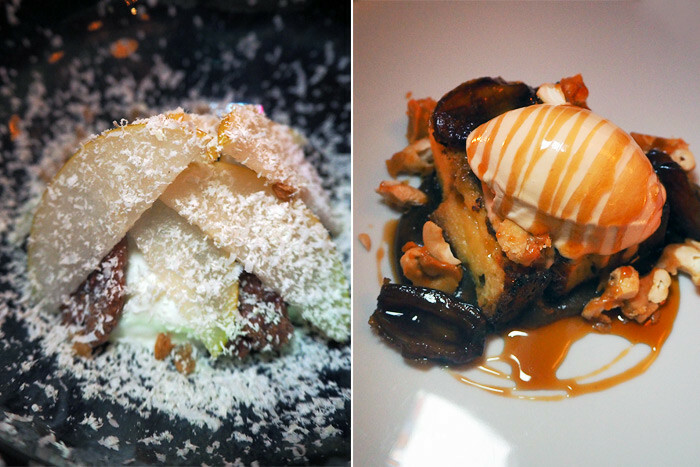 This “before dessert” dish on the left really blew me away. 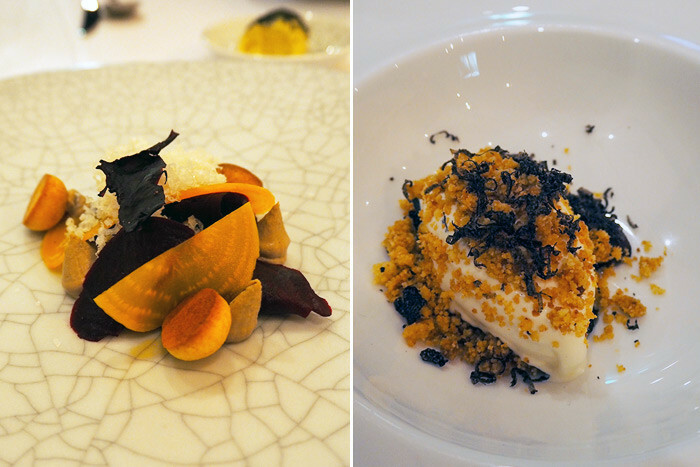 It featured Wood Side Goats Curd, Pecans, Dried Cherries, Nashi Pear and Puffed Barley – the contrast of the flavours and textures was incredible! And not to be outdone, my favourite dessert was the Milk Chocolate Mousse, Coopers Stout Torte, Hazelnuts and Salted Caramel. Subo – 551D Hunter St, Newcastle West NSW 2302. 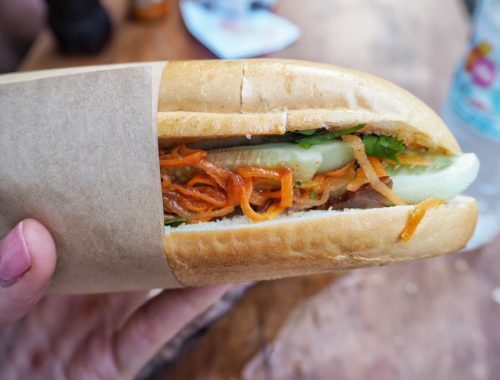 If you’re wondering which other restaurant has been awarded a prestigious One Chef’s Hat, then look no further than Subo! Head chef Beau and front-of-house Suzie are both formally from Guillaume at Bennelong, so you know you’re in good hands. The roasted beetroot with goats curd was simple yet stunning. And the highlight for me was the Truffle Crumble with Macerated Dates and Buffalo Milk Ice Cream. It smelt funky, but tasted mind blowing. 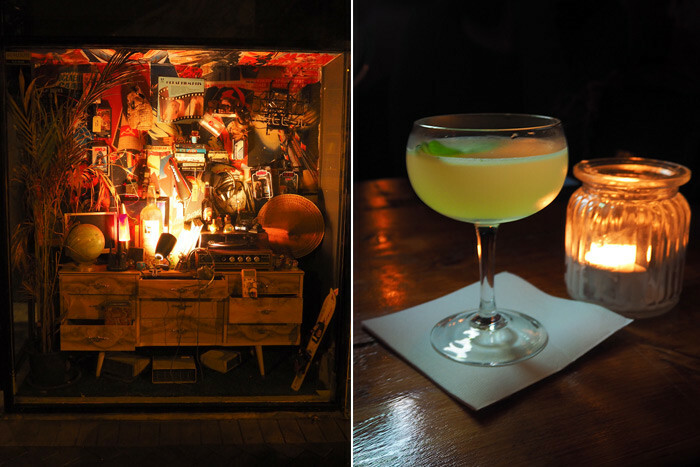 This bar is so secret they won’t even let you check in! But I can tell you, it’s on Hunter St… and (whispers) let’s just say it’s really close to Subo. We step into the darkness and learn why it’s called Koutetsu (it means steel in Japanese and is a reference to the mesh cages that fill the space). It features an impressive cocktail list which, to be honest, I could have spent all night sampling. A few years ago in this neglected part of town, this space was an old laundromat. 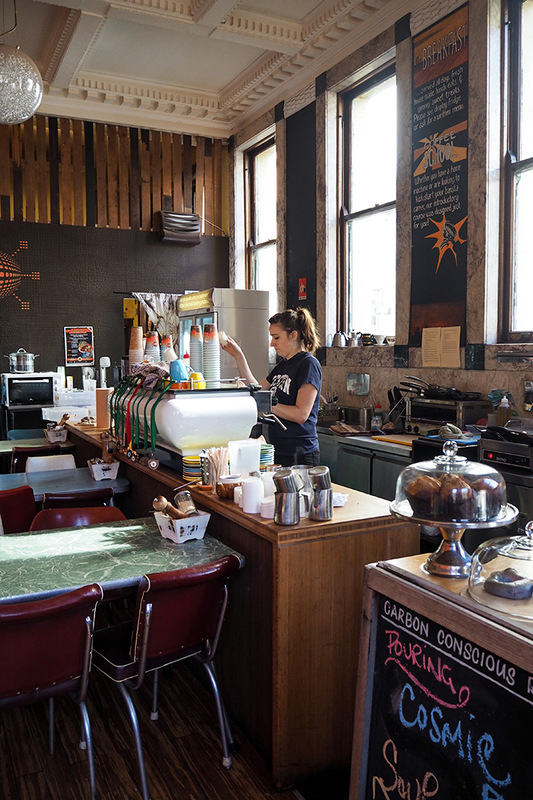 Now it has been transformed into The a bar, restaurant, café and coin-op laundry! That’s right, you can grab a drink and play a game of pingpong, all while you wait for your washing to finish. 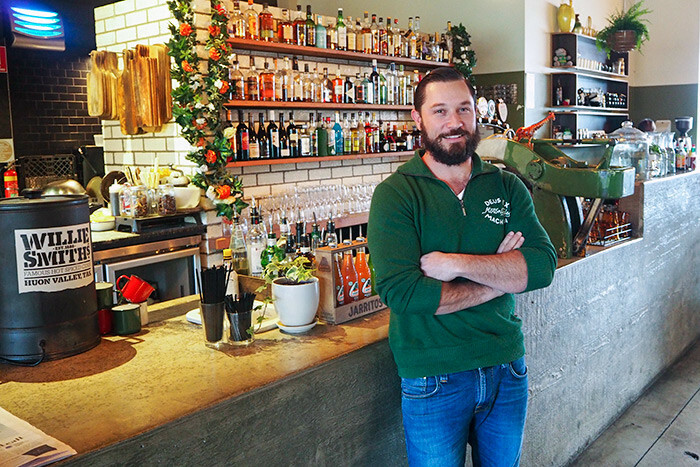 I had a bit of a fan girl moment when I learnt that one of the owners was Chris Joannou, formerly of Silverchair! I made him pose by the bar. Hi Chris! 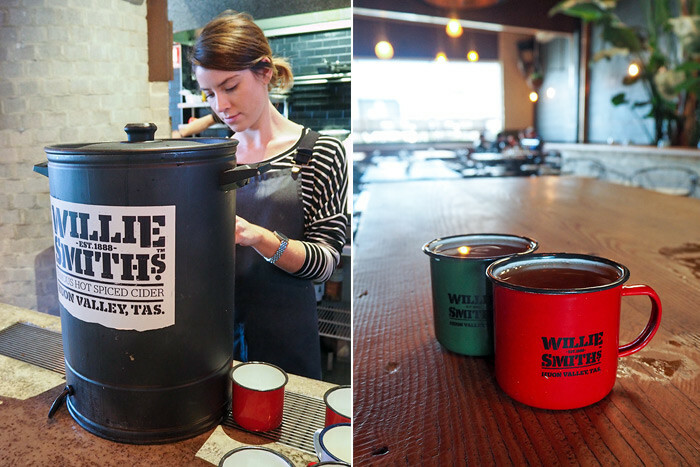 It was a chilly afternoon when we arrived at The Edwards, so the mulled cider from Willie Smith’s available at the bar was the perfect treat. After The Edwards we start our drive home to Sydney, stuffed to the gills and already making plans to return. Newcastle, you’re pretty damn wonderful! 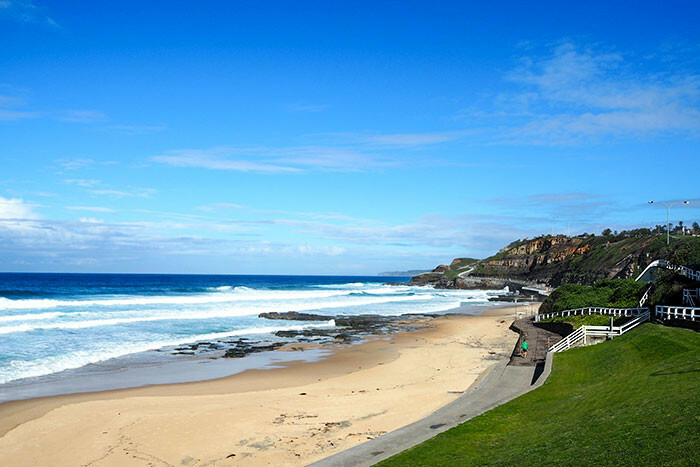 Have you visited Newcastle recently? 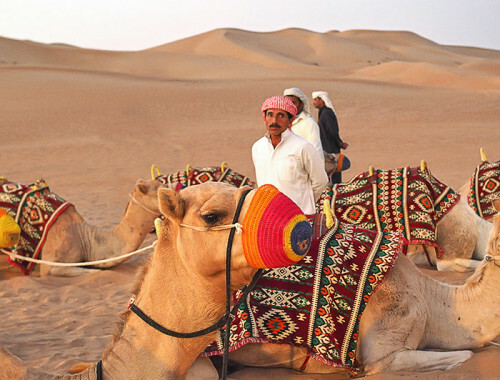 Have I inspired you to book a trip?